In the year 2707, 4 world corporations have taken control and have drained the resources of the world emersing the entire planet into ultimate warfare. Within the epic war, two opposing fronts have unknownly unlocked an ancient underworld that is over populated with Necromutants. The Necromutants are nearly unstopable, can multiple by the millions, and more savage and violent than all of the human armies put together. A couragous group of soldiers including a general, a warrior, and a priest set out on a suicide mission to destroy the root of all the Necromutants, a underground machine that transforms anyone into a deathless necromutant. Mutant Chronicles is yet to recieve a relase date and has been in limbo for over a year. I got my hands on a advanced screener and was excited to see it, after seeing the trailer a couple weeks ago. It stars Tom Jane (Punisher, The Mist), Ron Perlman (Hellboy), Devon Akoi (Sin City), and a brief cameo by John Malkovich. Directed by Simon Hunter Mutant Chronicles, is set in the 23rd century and has uses "steampunk" as its basis in fantasy. (Those of you unaware what steampunk is, it is a subgenre of scifi and fantasy that denotes an era in which steampower is used widely.) All of the steampunk stuff was absolutely awesome. It really added to the overall believability of the backstory and timeline of the wars. 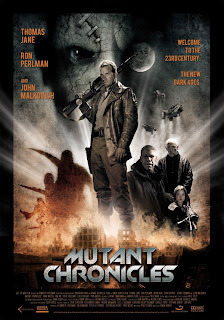 Overall, I enjoyed all of the backstory to Mutant Chronicles, the setup, the structure, and the epic size of its tale. Written by Philip Elsner, who also wrote Event Horizon, the film really has alot to it. Unfortunately, all of the setup and detailed backstory didn't help the overall execution of the movie and its terrible finale. The cast of Mutant Chronicles was good. Tom Jane really delivers a strong performance despite his one-dimensional character and the subpar dialogue in the script. His character is extremely hardened from all the years of war, but it is done in such a campy manner, you can never fully embrace him as the lead. Ron Perlman is also good in the film, but at the same time I found myself laughing at his character more times than not. The rest of the cast melds together, no one really stands out. Each of the remaining members of the team are setup as the most qualified to carry out this mission, but do not come across as capable enough to pull off the objective. No one is perse bad, just no one delivers anything of mention. The first and second acts of Mutant Chronicles are very powerful. It starts off very strong with a huge battle sequence between to opposing forces, Capital and Bauhaus. The militaries have a very WWI feel to them and everything is done perfectly. The steampunk genre is really represented during these sequences and also added to the believability of the complex backstory. I also really loved the all dark tones to the land, really signifying the desolation of earth and its resources. Organizing the team and setting out on their mission was done with impeccable detail. I felt that Simon Hunter really put alot into these first two acts and did a great job of making sure it was complex enough, while still being gripping and entertaining for the audience. The third act unfortunately, is not so refined. Once the team has reached the point of no return, the film turns to cheap thrills, similar to the likes of films such as DOOM, House of the Dead, and Resident Evil. The film feels much more like a splatter film in the thrid act, while the first two were much more detailed scifi. The finale is so poorly written and executed you feel jipped after watching such a strong setup. Ultimately, the end is downright comical and overall a major disapointment. Finally, Mutant Chronicles is a epic tale that tries to reach a grand scale, but ends up only feeling like a straight-to-dvd flick. It wanted to be edgy like 300 but, ends up feeling like Serenity. That said, I still really enjoyed the movie and will watch it again and again. Mutant Chronicles should find a "cult" audience like Starship Troopers or Firefly did, one that will really appreciate and love the movie, even the crappy parts. All of the action is strong, despite being way too formulaic in points. The movie is extremely gritty with some amazing sets and imagery that is truely eye-popping for the viewer. Mutant Chronicles could have been a new staple in the way of scifi, but ends up being a solid second tier or B movie. hmmm I do want to see this one at the very least it seems like a fun project.